"It's a piece dating from the era when violinists were encouraged to display what they were capable of: Symphonie Espagnole by Eduoard Lalo. Never before had the violin been so thoroughly engaged. For the first time, the left hand reached so high that it nearly left the strings; the lowest string the G string was utilized in its entirety, which added color effects to the tone. One of the virtuosi from that period, Pablo de Sarasate, was the inspiration for Lalo when he composed the Symphonie Espagnole. Lalo called it a symphony, but the composition played last night in the Tilburg Concert Hall (Concertzaal Tilburg) by violinist Adelina Hasani is a violin concerto, airy, melodious and entertaining, filled with Spanish folk melodies as the name implies. Concertmaster Adelina Hasani was in control of everything. Quick, agile, and playing intensely into the string, she guided her instrument as well as the orchestra precisely to where she wished to be: inside the music's warmly beating heart. The orchestra offered her collegial security, following her attentively, allowing her the requisite space for the numerous rapidly darting passages while maintaining reliable tempi and beat." "..Badings composed this work [Concerto for Two Violins and Orchestra]originally for Theo Olof and Herman Krebbers. On Thursday it was Ilya Grubert and Adelina Hasani who made the twin solo scores sing in lyrical intricacy." 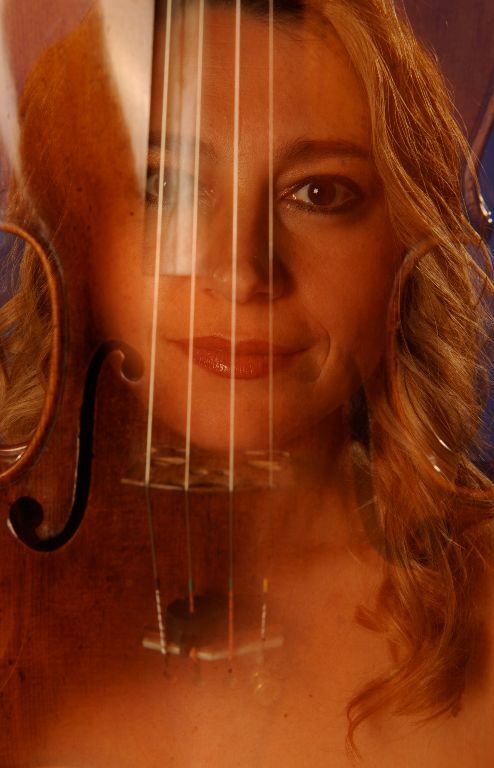 "..After that came Mozart's Fourth Violin Concerto, with as soloist the orchestra's concertmaster, Adelina Hasani. The Albanian violinist once again treated us to a sample of her virtuosity at its peak; one can only watch and listen with tremendous admiration. She had already indicated during the introduction that playing with her own orchestra invokes a particular tension and inspires her to give the finest of her capabilities. This resulted in a fantastic performance of this violin concerto." "..Richard Strauss's symphonic tone poem, Ein Heldenleben, gave concertmaster Adelina Hasani the opportunity to shine . . . . It was remarkable when Adelina Hasani's solo violin blossomed in the openings and cracks in the wall of sound. She played her part with fiery certainty.."
"Brabant Philharmonic Concertmaster Adelina Hasani perceives the Music Through and Through". "Yesterday afternoon, concertmaster Adelina Hasani – together with the Brabant Philharmonic Orchestra—played Prokofiev's First Violin Concerto. She was invincible in both her stage presence and her manner of performance – the latter, in particular. This violin concerto contains all the elements for keeping the listener's attention riveted. It demands personality and vision of the soloist in addition to tremendous technical accomplishment; a warm, lyrical tone; and a self-confident presentation. Adelina Hasani had all these. Buoyed by the powerful sound of her instrument, she confidently led the troops, indicating with conviction which direction she wished to take and revealing thorough perception of the music. Her bowing style was strong, her fingers landing with sureness as they flew over the strings; her sound was generous, and she showed great sensitivity to the piece's atmosphere. She demonstrated that, as a soloist, she is deserving of a wide audience. The orchestra and solo violinist played with attentiveness to each other and colored in the piece with great imagination." "..Bartók's music [First Concerto for Violin and Orchestra] offers little in the way of a harmonic or rhythmic foothold. The soloist is obliged, for the most part, to apply a sense of structure to the piece. Adelina Hasani accomplished this overwhelmingly . . . She played the fast movement in a manner that was fierce and virtuosic, relying on her inner strength." "..En route to the Romanticism of Beethoven's Eroica following the interval, The Brabant Philharmonic makes a refreshing pit-stop for the less frequently played violin concerto that Bartók wrote for his beloved. During the unaccompanied passage in the delicate opening Andante, the young Albanian violinist Adelina Hasani immediately lets us hear her impressively spot-on intonation.."